There are many of such sports conducted at or near the biblical sites. 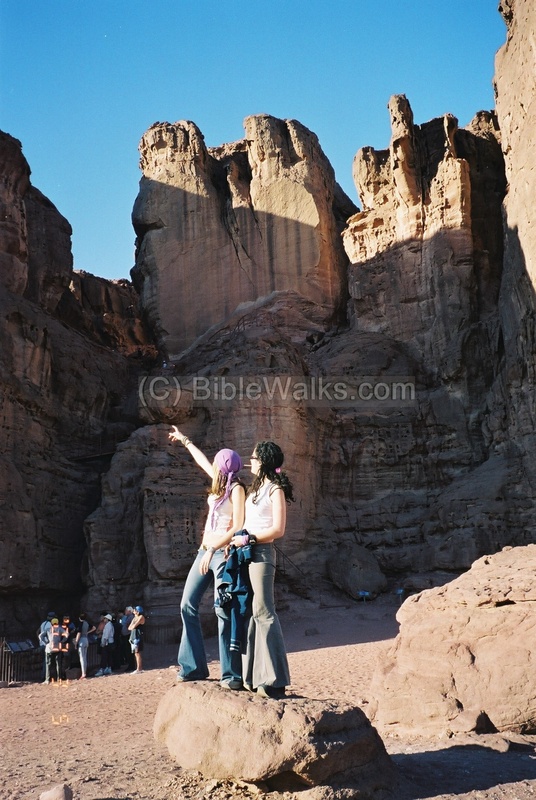 This page provides an overview of such activities, mapping them to the sites featured in BibleWalks.com. 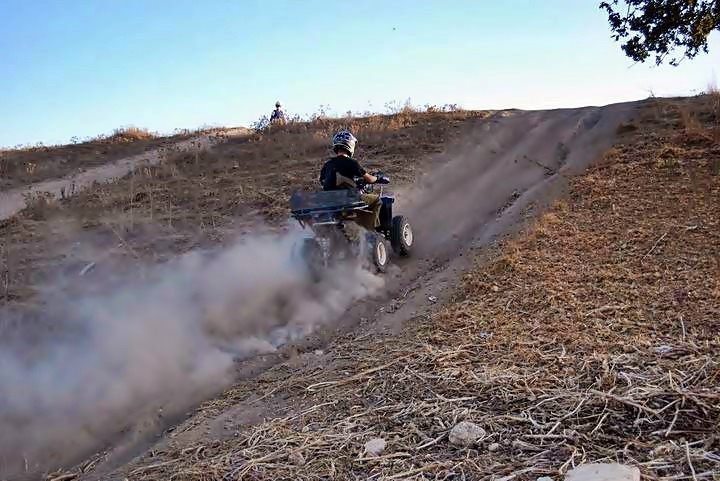 Extreme sports include a large variety of outdoor activities, such as climbing, gliding, mountain biking and other sports that feature speed, height, danger and other thrills. 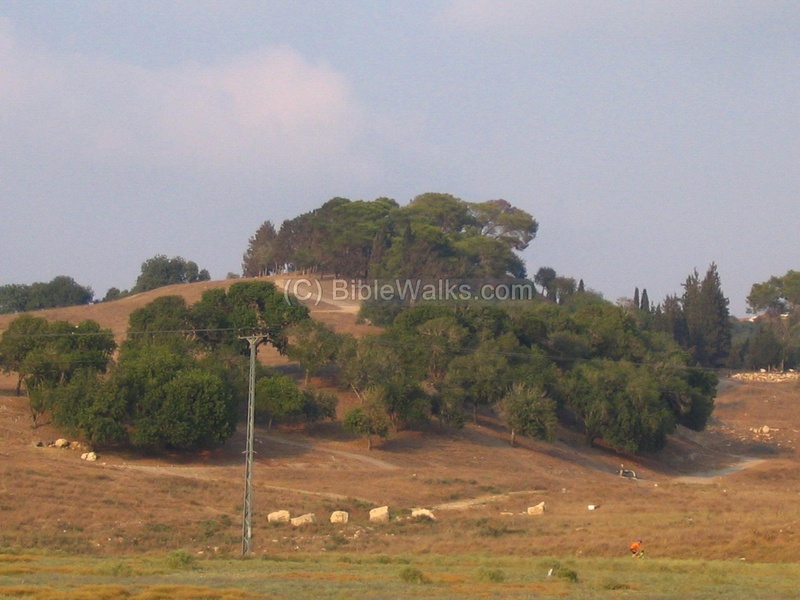 There are frequent visitors to the Tells (the biblical mounds). 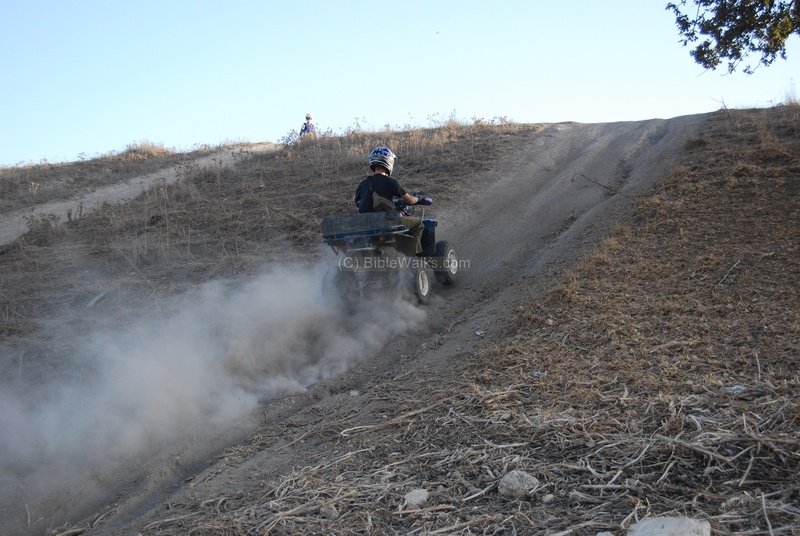 These include dirt bikes, ATV (All Terrain Vehicles) and motorcycles - that shoot up the high slopes. The following photos are from Tell Kisson in the plains of Acre. A closer view of the group. In the background is the entrance to the Tell, where recent excavations were done. Another photo was taken on the northern slopes of Tell Shimron. There are many clubs and members of Mountain biking in Israel. 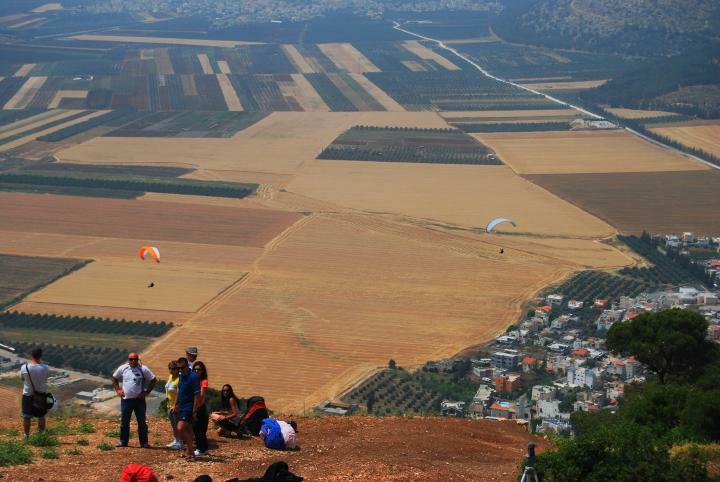 It is a popular weekend sports in Israel. Many of their routes pass by ancient sites, since the Holy Land is populated by thousands of such sites in a compact country. 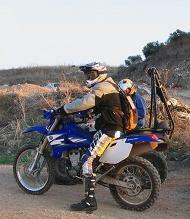 One of the biker clubs is from Sdeh-Boker (their web site is in Hebrew only). This is the Kibbutz of the late David Ben-Gurion - founder of the state of Israel, and located in the center of the Negev desert south to Beer-Sheba. 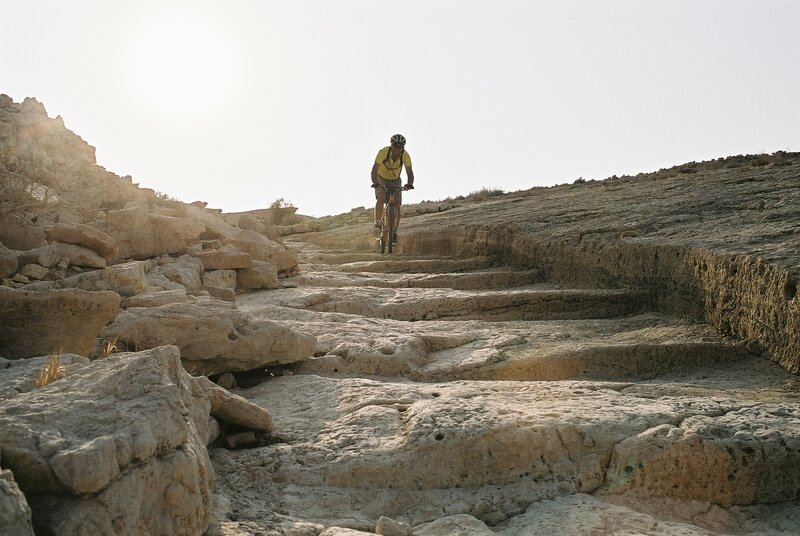 The following photo (courtesy of Dr. Hezi Yizhaq and Ilan Shoham) shows a biker riding on the ancient rock-cut Roman road Ma'ale Akrabbim, one of the spice route passes in the Negev desert. 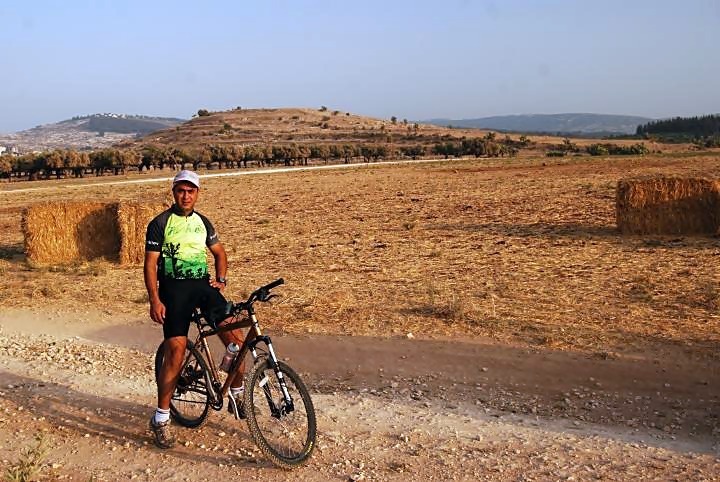 The web site publishes some desert bike routes, such as from Sdeh-Boker, along Nahal-Tsin to Hazeva (in Hebrew, but you can enjoy the photos). 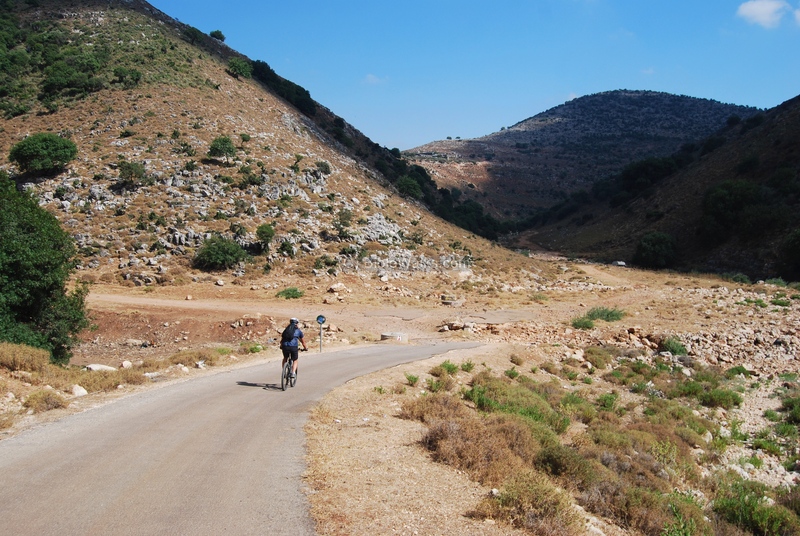 The photo on the left was taken in the north side of Israel, at the foothills of Tell Shimron. On the right is a biker in Hilazon creek near Kh. Fachir. 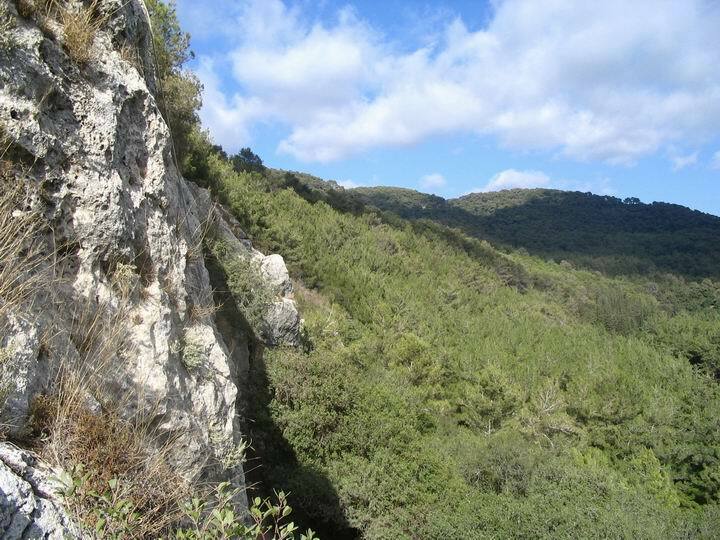 Other popular sites include the Arbel cliffs and different locations in mount Carmel (such as Keren-Carmel area). 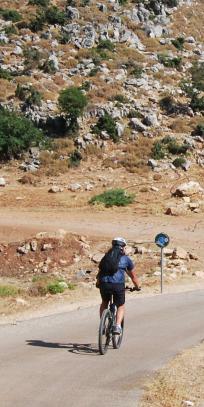 Another biker is seen in the Biblical city of Neiel (below). There are several popular sites. 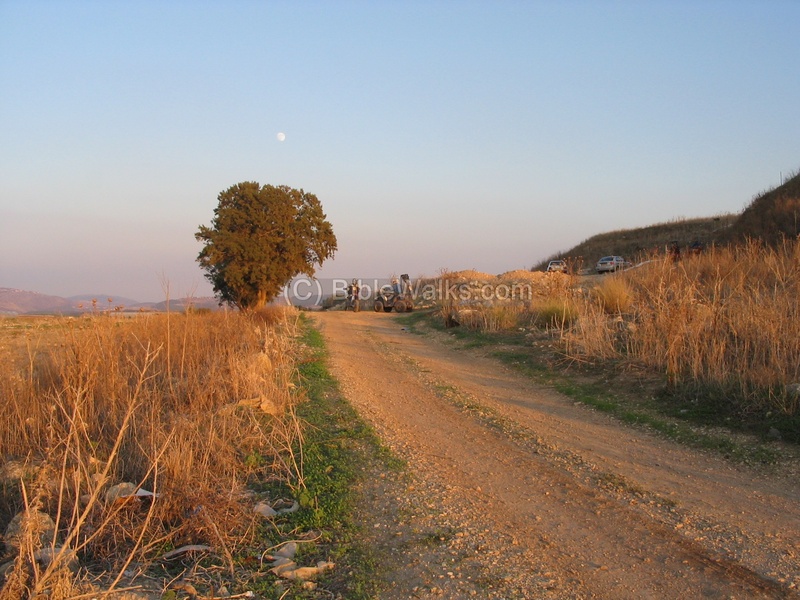 The following photos are from Khirbet Oren on mount Carmel, the site of a city in the Hellenistic and Roman periods. The stone wall in this site raises up from the valley almost vertically, and is a favorite place for rappelling, as can be seen in the next photos. Underneath is a tomb cut into the stone. 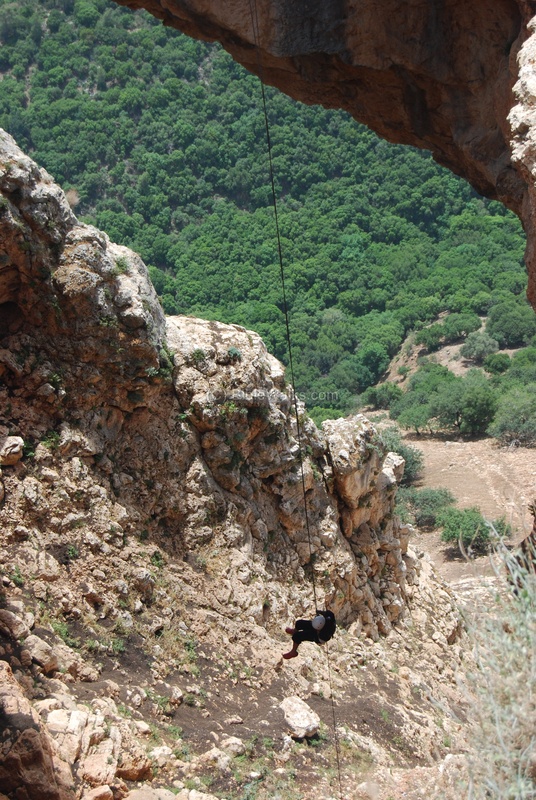 There are many other popular rappelling sites, for example the Keshet (Arch) cave on the border with Lebanon, which is also a prehistoric site. 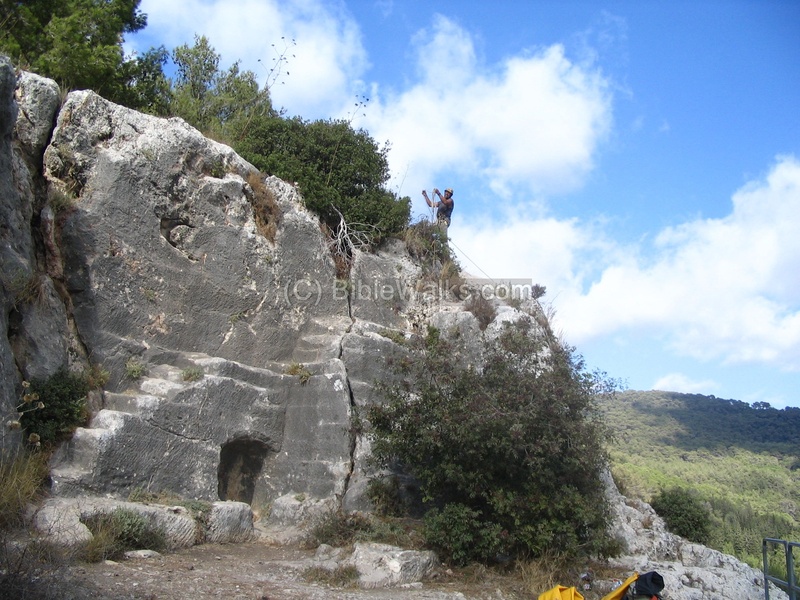 Another popular site with an easy access is Pigeons caves, a prehistoric site in the western edge of Beit HaKerem near Karmiel, with remains starting from 50,000 years ago. Although hiking is not considered "extreme", we have included it as a outdoor sports activity. 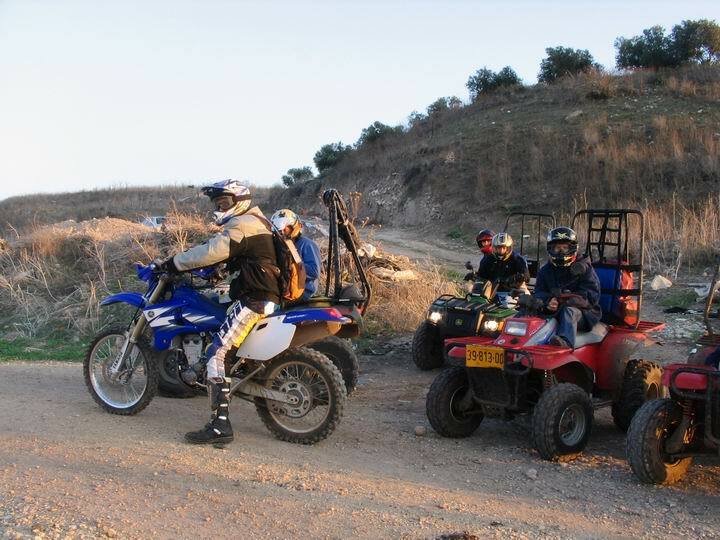 Many are engaged in this activity, and most of the routes pass through the Holy Land ancient sites. An example of one of the hiking tours can be seen in the photo on the right. The park of Timna near Eilat is the site of the Israeli copper mining industry, as you can see from the red color of these cliffs. The extraction of the copper started in the Bronze period with extensive mining done by the slave work force of the Egyptians pharaohs. In the site called "Solomon's Pillars", here on the background, there is an ancient Egyptian temple dedicated to the goddess Hathor which served the Egyptians. In the red rocks around the site are hiking routes, Jeep travels, mountain climbing and more. A special photo is seen below, and can be called "Hassidim on Hike". 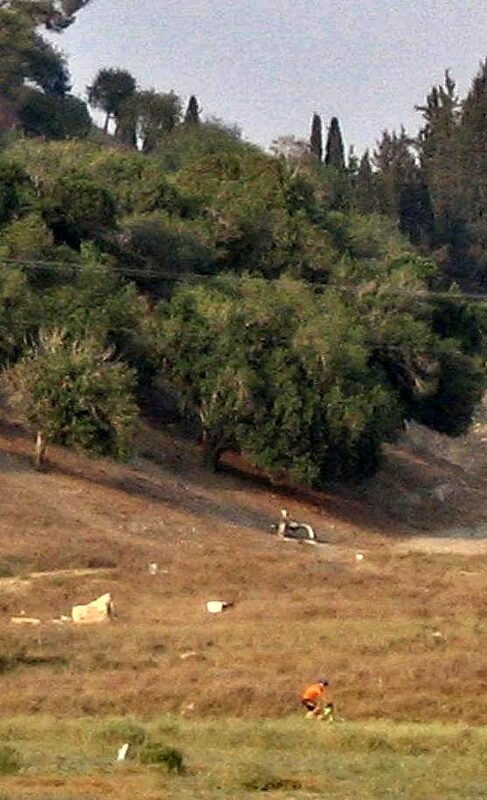 The two Hassidim were seen hiking near the Holy city of Zefat, in the area of Ammud creek. This is an unusual scene, since usually these religious students are rarely seen in nature treks.